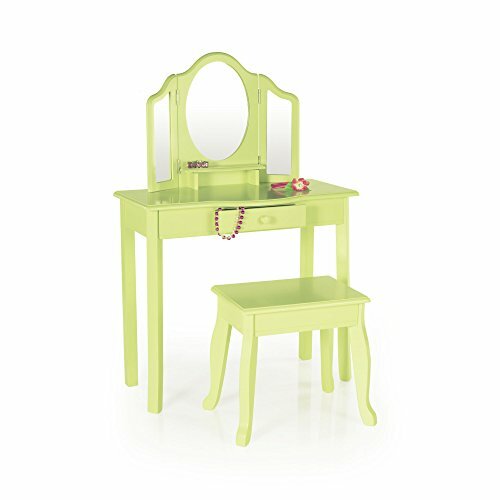 With this two-piece vanity and stool set, your little girl can keep her brushes, jewelry, and pretend-play make-up ready for dress-up and everyday occasions! Features a 3-section Mylar mirror with gently scalloped silhouettes and handsome edge routes for a timeless look. Single storage drawer and under-mirror shelf offers convenient space to keep accessories and playthings, while stool seat flips-up to reveal additional storage space. Furniture-grade construction makes this a childhood essential. Also available in pink, lavender, light green, grey, white, and espresso finishes. Adult assembly required. Ages 2+. Vanity: 28"W x 13"D x 42"H Stool: 16"W x 13"D x 15"H.
Also available in pink, lavender, light green, grey, white, and espresso finishes.